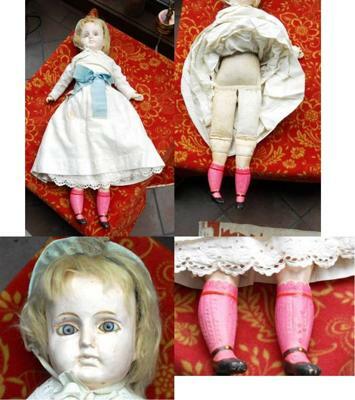 We have a 28" doll estimated to be from somewhere close to 1915. It seems to have no markings for identification. Although, it does possess some unique characteristics. This doll seems to have a bisque like face and limbs. About shoulder length to mid-back area this bisque type material ends, and a linen stuffed with a straw/grassy substance begins. The bisque begins at just above the elbow, and just above the knee. She is dressed w/ layers of petticoats, topped w/ a white cotton dress and a removable laced collar. She has a blue ribbon sash. Her calves are painted bright pink to appear like stockings. She has particularly small feet with painted black Mary Jane. Her eyes are detailed, light blue and appear to be glass. Her hair is pale blonde. Her mouth is not open, nor are her nostrils. Hopefully someone can help with the identification process.